Wolverine and the X-Men #35 is packed cover-to-cover with superheroic fisticuffs, krakoa smackdowns, and at least three “YES YES YES!” moments. I won’t go into specifics because spoilers, but Jason Aaron really brings his A-Game with the ending to his “Hellfire Saga,” which makes for a comic filled with humor, action, and strong characterization. 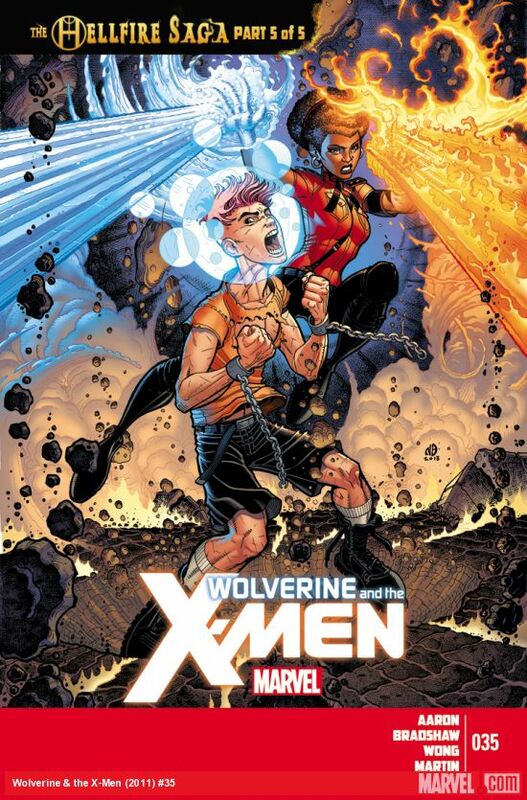 Quentin Quire, Idie, and the Toad/Husk story get some especially fantastic beats this issue, and the ending to the book really feels like a legitimate denouement heading into the “Battle of the Atom” crossover. Nick Bradshaw has become the quintessential W&XM artist. Yes, Chris Bachalo kickstarted the series with his innovative lay-outs and distinct style, but its Bradshaw’s animated aesthetic that brought the quirkiness and novelty to match Aaron’s “strangest heroes of them all” mission for the book. I mean, I can’t see anybody but Bradshaw drawing a character named Snot literally blasting lasers of snot at people. Literally. It’s too much. Walden Wong’s (what a name!) solid inks maintain that animated, cartoon linework while the army of colorists fill the page from gutter-to-gutter with vibrant pinks, oranges, and reds and rich blues and greens. Brilliant. What Do The Women in Comics Want?